-longer lasting, you can add more liquid to continue receiving benefits, long after your placenta capsules are gone. -The tincture doesn't need to be refrigerated or frozen for long term storage, just keep in a cool, dark place. -It is beneficial in times of transition, stress, or illness, PMS, depression or menopause. To use, just add 10-40 drops to a beverage of choice (juice, smoothies, etc. ), as needed.It is made using a piece of placenta from the mother's side & 80 proof alcohol and put into a blue glass bottle with a dropper. The tincture is ready to be used after six weeks. When the bottle gets to half empty, you can add more 80 proof alcohol. You may strain the placenta piece out, but it's not necessary. 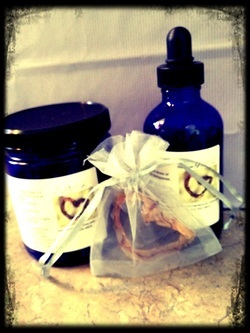 If you have previously had your placenta encapsulated, I can make you a tincture using some of your capsules. Contact me to discuss the details.